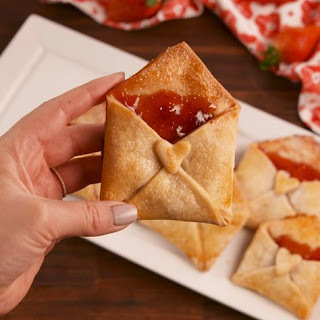 When I was looking for ideas for Valentine treats, I was inspired by the look of these strawberry love notes. We didn't need another sweet treat so I decided to make a savory one that looked similar. It had to be kid friendly, which typically equates to lots of carbs and fat. From experience if food has cheese or bread or something of that sort, the kids will devour it. So I made small spinach and artichoke cheese pies. In the shape of closed envelopes, sealed with a little heart. They were so cute not to try! I used store bought crust but it was too doughy and my family thought it was weird. So on my second attempt, I rolled the dough thinner before adding the filling. I also added more filling. The filling is basically spinach/artichoke dip with extra cheese. It went from weird to good. So that was the plan. 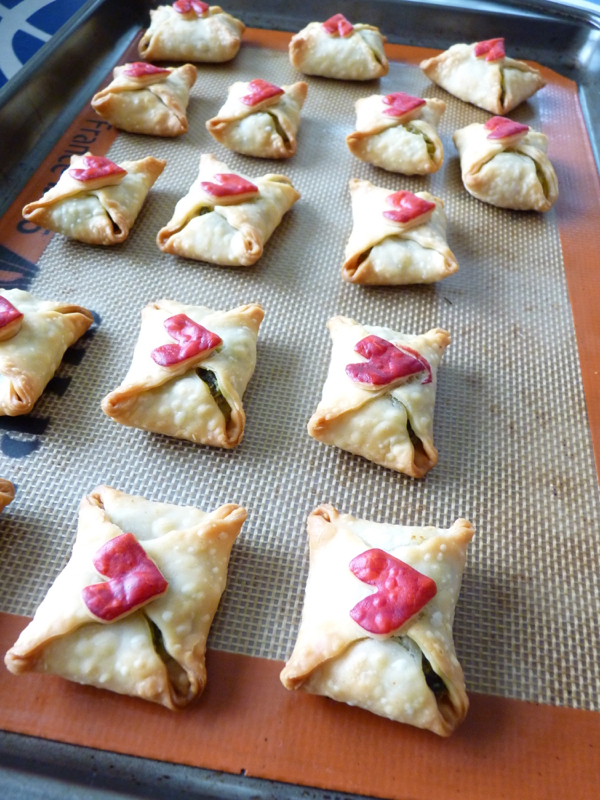 When school was canceled because of the snow, I was a bit bummed I couldn't make these treats again. But then we received news that the makeup Valentine's party was going to happen in less than 24 hours. It was a baking marathon after that! I used a square cutter for the envelopes and then kind of stretched it to look a bit more rectangular as I was closing them. I had to hack at the small heart because I had no cutter that was small enough. That was probably the hardest part. I made sure not to overfill them because they were going to expand during baking. Since these were no longer the experimental ones, I was a lot more careful making them. Plus, I made probably 40 pies. It took a couple of hours. Ugh. 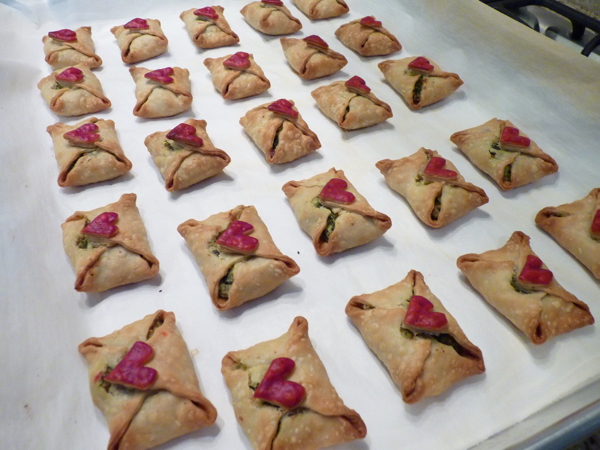 At the party, many kids were turned off by the fact it was savory and had spinach in them. However, I noticed many kids were curious and said they would try it and took one as well. I think because they looked so cute. Obviously, these were custom made so they probably never had anything like them before. Some people are scared to try new things. Knowing that, I would call these a success. The parent volunteers wanted to try some at the end of the party and they all loved it. So yeah, it's more adult party food material. Lol.